Whether drinking in Japan for business, pleasure, or both, knowing how to say "cheers" in Japanese is essential. Following a few rules of drinking etiquette in Japan could help you avoid some potentially embarrassing situations. Drinking in Japan can be a serious affair. In a culture bound by many social protocols, tearing them down together builds unity and cohesion. As the drinks flow, things often take a turn for the rowdy. You may look bad if you hold back. Many relationships, both business and personal, are forged by getting falling-down drunk together and singing terrible karaoke. Drinking sessions can sometimes go for hours until someone finally relents or passes out. Luckily, the few rules of Japanese drinking etiquette are simple: be a team player, cut loose without fear, and help others feel comfortable doing the same. Most importantly, never cause someone to feel embarrassed! The easiest way to say cheers in Japanese is with an enthusiastic kanpai! (sounds like "gahn-pie"). You may hear banzai! shouted at some point, but leave that for some frenzied moment later. Often voiced with enthusiasm as glasses are raised, kanpai translates to "empty cup" — the Western equivalent would be "bottoms up." Tradition once dictated that people were expected to finish their cup of sake (rice wine) in one shot. That's why the cute cups are conveniently small. Now that beer is more or less the drink of choice, you can certainly get by with just raising your glass and taking a sip each time someone offers a toast. No need to revert back to your chugging skills developed at great cost in higher education. Taking small sips of your drink during each toast may be a good thing, at least initially until you determine the rhythm of the session. There may be scores of toasts given throughout the night! Pro Tip: The correct pronunciation of sake is "sah-keh," not "sah-key" as often heard in the West. Although less common, you may hear omedetou (sounds like "oh-meh-deh-toe") used for some toasts. Omedetou means "congratulations" in Japanese. As the night wears on and the sake flows, don't be surprised to hear an occasional shout of banzai! ("to live 10,000 years") as all glasses are brought together. Be enthusiastic. Don't be the one at the table who apparently isn't excited about living 10,000 years. As in any culture, following the lead of your local friends or hosts is always the best course. Don't push others to begin an epic drinking session until it's clear they are heading that way. Settings vary, and sometimes people adopt more relaxed approaches to make Western guests feel more comfortable. Before anything else, make an effort to meet everyone, assuming you don't know them already. Give respectful bows when appropriate. The most basic rule of drinking etiquette in Japan to never take a drink alone. Always wait for the whole group to receive their drinks before touching yours. Then wait for someone to offer a kanpai! before you raise your glass and take the first drink. Make eye contact with those nearest as you raise your glass. Angle your body and pay attention to whoever is giving the toast. Whether touching glasses together or not, the glass of the most senior person should be slightly higher than yours. 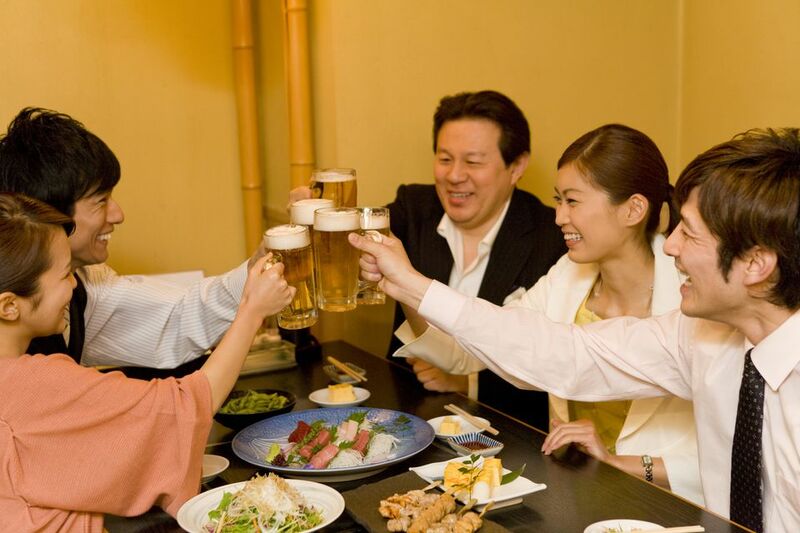 Beer is often the choice for social settings and business occasions in Japan. Sake is still popular, although whiskey and bourbon have gained a significant following. In fact, bourbon is so popular in Japan that Japanese companies are buying iconic Kentucky bourbon brands — Jim Beam, Maker's Mark, and Four Roses to name a few. Your Japanese cohorts may prefer to drink sake with you just for the experience. The rice wine has been an important part of the culture since at least the 8th century. Although technically not required, ordering the same first drink as others in the group is good form and makes sharing easier. Remember: the outing is about building team cohesion, not individual preferences. Don't go for your usual cocktail choice, especially in formal settings. That gin and tonic can wait. Instead, be a "team player" and stick to beer, sake, or whiskey. Drinking in Japan is about having a shared experience. Today, beer most often accompanies a meal, while sake is enjoyed with appetizers or light fare. Sake often accompanies sashimi (raw fish). If your Japanese drinking session begins with sushi and sashimi nibbles, you should know how to use chopsticks and some basic sushi etiquette. At the least, don't mix up a murk of wasabi and soy sauce for dipping your sashimi. When drinking in Japan, try to never pour your own drink. It is customary to allow others seated close to refill your glass from their bottle, communal bottles, or a tokkuri (sake bottle). You should reciprocate, assuming that you are drinking the same thing. Don't dictate or switch their drink choice. Always reciprocate when someone pours a drink for you. Ideally, by the end of the evening, you will have poured a drink for everyone present. Typically, the younger or lower in status pour for the senior members of the group (or honored guest) first. Hierarchies are especially observed during business meetings. Business cards put on the table should always be face up and treated with respect. The senior executive's card should always be at the top. When someone is filling your glass or sake cup, you can show courtesy and mindfulness by holding the glass with both hands and being attentive to their gesture of goodwill. Avoid looking elsewhere (especially at your phone) or talking to someone else when your glass is being filled. If someone refuses once or twice to let you pour their drink, it doesn't mean they are finished drinking. Most likely they are just demonstrating humility — a valued personal attribute. Insist that you wish to fill their glass unless they adamantly refuse. Tip: Sake is given as an offering to gods, is shared at weddings, and is used in important ceremonies. Kamikaze pilots even drank sake in a ritual before their missions. Show respect when handling the spirit. Women (and men in some settings) often hold a sake cup with both hands. The fingers of the left hand should be resting gently on the bottom of the cup. Again, be careful about sipping from your glass alone throughout a meal as people do in the West. Japanese drinking sessions can turn into full-on drinking marathons that continue almost until time to go to work in the morning. Don't start strong and then fail to finish. Between toasts, sip water instead of alcohol, and wait for the group before drinking whatever alcoholic beverage has been poured. If you do need to sip beer just to help wash down your meal, you don't really have to offer a kompai! each time. Simply raising your glass and meeting eyes with someone is good enough. If someone makes eye contact with you and expresses interest in taking a drink with you, lift your cup immediately. Ignoring the gesture or not taking at least a little sip is considered impolite. When drinking in Japan, or in any formal group setting, more emphasis should be placed on the group as a team rather than the individual. Individuality (e.g., being the most loud, gregarious, or attention-hungry person at the table) can be considered culturally rogue and impolite. What If You Can't Drink Any More? It's bound to happen. And although others at the session may be sad to see you stop, there's little chance you'll be given grief about it. Causing anyone embarrassment for their lack of tolerance would be a major breach of etiquette. When you've hit your limit and can't drink any more, simply stop! Leave your glass full so that no one will continue to give you refills. You can still lift your glass during toasts and feign a small sip, but others will get the clue — or maybe never even notice — when your glass no longer needs refilling. Most commonly used at the end of the night, otsukaresama deshita (translates to "you're tired") is appropriate in context when someone is leaving or winding down. The expression is used to convey a sense of "good work" for a job well done. Telling an associate that they are tired is an extremely nice way of saying they are a hard worker, have valiantly given their all, and deserve to go retire. Expressions such as these are a part of the culture of giving and saving face. Understanding the basics will greatly enhance your experience in Asia. Enjoy the cultural experience. Drinking in Japan is all about the group experience — including hangovers!